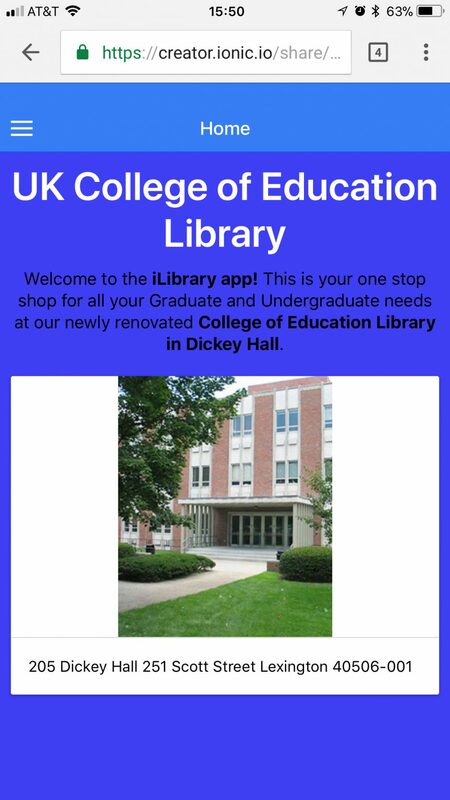 Dickey Hall is an aging building that houses the College of Education library at the University of Kentucky. It is slated for renovation this summer. With the renovations scheduled, it seems like the perfect time to re-imagine the library and how students, faculty, and the community can use it. Our team focused on how to redesign the College of Education library to enhance the success of graduate students and other users. We wanted to offer a solution to many graduate students’ issues that make utilizing the library an obstacle, therefore hindering their success. The iLibrary app provides users the convenience of scheduling child watch while parents are using the library, ordering food and drinks with the connection to Tapingo, a food service which will deliver on campus, making room arrangement reservations ahead of time to ensure available space and seating, and searching for and reserving books through the library’s online catalog. If graduate students need help understanding how to use the library services, the app provides a link for tutorials and the opportunity to schedule one on one training with the librarian.